As regular readers may have noticed, an advantage to my data entry job is being able to listen to things. Rows of people in Cubicleland are plugged in to music, radios, audio books, and in my case, podcasts. 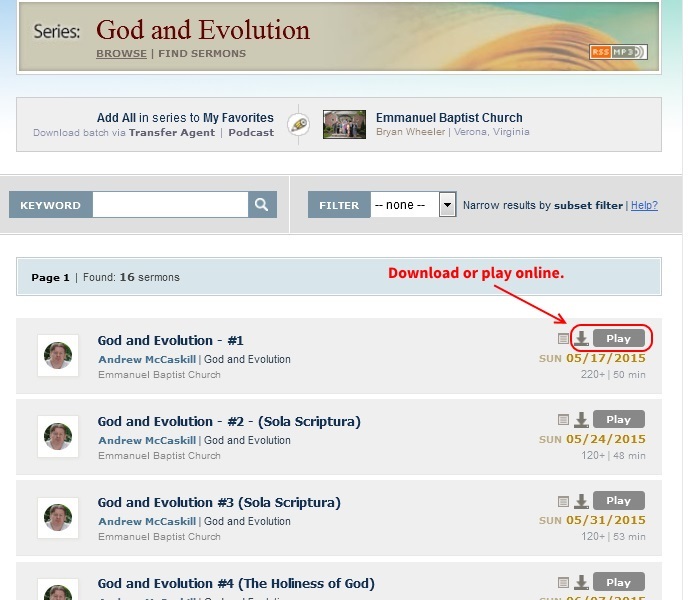 I happened across this series called "God and Evolution" by Andrew McCaskill on Sermon Audio, and am pleased to share it with you. The lecture series is a mite longer than I usually share, what with being sixteen parts and all. But I reckoned it was important. It was presented April-September 2015 at Emmanuel Baptist Church in Verona, Virginia. Mr. McCaskill isn't one of those yee-ha entertainment-driven teachers. Instead, he is soft-spoken and more concerned with delivering his content. 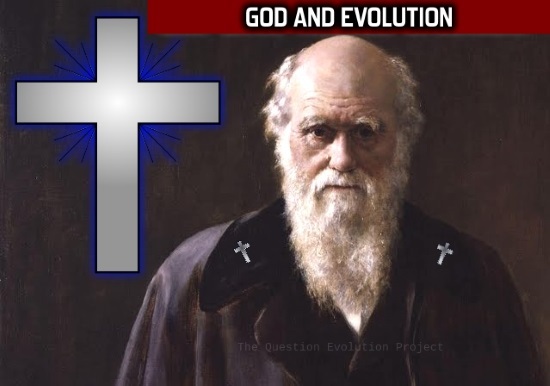 You won't be overwhelmed with science, but there is some as well as serious theological content involved; Andrew show serious flaws in theistic evolution. Y'all know how I feel about that stuff. Andrew McCaskill has taught biology for sixteen years. Six of those years were in Thailand, where he led creation/evolution seminars to help Thai Christians understand the implications of the origins debate. Nowadays, he's teaching biology at Grace Christian School in Stauton, Virginia as well as teaching at his church. But that's not enough! He's also studying at Reformed Theological Seminary, and has a wife and four children. Busy guy! These talks can be heard online or downloaded (either way is free) from Sermon Audio. The picture below (click for more bigness) is what you'll see when you click on the link I'll give in a moment. If you're not a member of Sermon Audio, don't worry about it when you get a prompt to sign up. Click on "Maybe later", and the download starts right away. Some of the lectures have notes in PDF, so if you're inclined to getting those, click on the title of the message and look for the "PDF Text" button below the download audio options. I think you'll be educated and blessed by paying attention to these lectures. 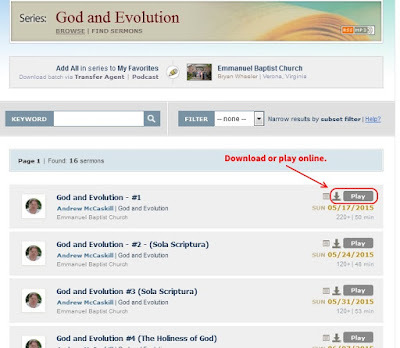 Click here for the "God and Evolution" series at Sermon Audio. These Fists Were Made for Punching?